Sudan President Omar Al-Bashir “will not fall unless the army sides with protesters”, Heidar Ibrahim, Sudanese professor of political and social sciences, said in the wake of demonstrations sweeping across Sudan since 5 December. The protests erupted from Sennar, a town on the Blue Nile south of Khartoum, following the closure of bakeries due to the lack of flour. Demonstrators marched in the districts of the Sudanese capital for days, but the turning point took place in the northeast city of Atbara, considered the capital of labourers, on 19 December because of bread shortages. For hours on that day the government lost control over the city, during which time protesters burnt the headquarters of the ruling National Congress Party, the security apparatus and the central administration. In sync with the Atbara protests, demonstrations erupted in Port Sudan, the country’s main port, and spread to the north in Dongola, Karima and Metemma, to the east in Al-Gadarif, to the south in Madani, Rabak and Sennar, and to the west in Al-Abyad and Nohoud. “These are nationwide protests in every political and geographical sense of the word. However, they remain weaker than to cause the downfall of the regime, unless the army takes the side of protesters,” Ibrahim told Al-Ahram Weekly. This is because “Al-Bashir’s regime created a state of ‘securocracy’ where everyone doubts everyone,” he added. “Since the [Muslim] Brotherhood came to power, they assigned their followers in every state institution, starting with headmasters of primary schools all the way through to the highest offices in ministries,” stated Ibrahim, who has written extensively on Islamist rule in Sudan. “This environment created thousands of hypocrites and fearful people, so it was easy to govern them. [The Brotherhood] arrived to control electoral institutions such as syndicates and unions. This way they eliminated any organised opposition against them,” he added. “Even the civil war in the south, with all its casualties, and the division of Sudan didn’t shake the regime. These events would have caused the collapse of the state anywhere else,” said Ibrahim. It is widely known that since Al-Bashir’s ascent to power with the blessing and support of Islamists he waged a “religious war” against countrymen of the south. Throughout the 1990s he insisted the unity of Sudan was untouchable. Nevertheless, Khartoum and the Sudan People’s Liberation Movement, led by John Garang, signed a deal in January 2005 that gave the south the right of self-determination. South Sudan gained independence in July 2011. Al-Bashir rose to power via a military coup that was designed and executed by Sudan’s Islamists under the leadership of the late Hassan Al-Turabi. Following disagreement between Al-Bashir and Al-Turabi, the latter famously told Al-Bashir, “go to the palace as president” while sending him “to prison as an inmate”. Al-Turabi justified his coup against democracy in which he, as foreign minister, and party leaders participated saying it was the only way “for Sharia law to prevail” over secularists. Ibrahim observed that Sudan now has more than one army: the national armed forces, quick intervention tribal militias in west Sudan and security forces that are mainly comprised of Islamists. For more than 29 years of Al-Bashir’s rule, the military was filled with Islamist officers that have directly pledged allegiance to the regime. “This is a clear case of fascist rule. The regime will not fall unless the army abandons it,” said Ibrahim. Western newspapers cited local sources as saying that one of the quick intervention leaders, Mohamed Hamdan Daqlo, a Darfur warlord, took the side of protesters and called upon the regular army to side with the people. Daqlo is “a tribal leader who took part in the war in Darfur. He is not in the regular army, so he doesn’t have credibility in his defence of popular demands,” Ibrahim pointed out. Meanwhile, the regime responded to protests with “lethal force”, said Amnesty International. It said in a statement last week it had “credible reports that 37 protesters have been shot dead by the security forces in five days of anti-government demonstrations”. 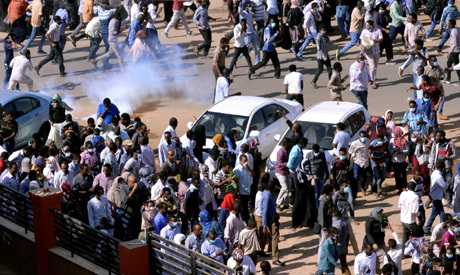 Meanwhile, Sudan’s minister of information said 17 protesters died and 35 policemen were injured during demonstrations. Head of security Salah Abdallah said police didn’t shoot at protesters and that confronting disorder was one of the tasks assigned to the police. Later on, during a meeting of security forces with Al-Bashir, Abdallah said “security forces are conducting their constitutional duty” of protecting the country. No sooner had Al-Bashir promised “real reforms”, he accused the protesters of being “traitors”. Sudan authorities announced Friday the “arrest of a cell affiliated to the rebellious movement of Abdel-Wahed Mohamed Nour in Darfur” that “aimed at inciting chaos” in Sudan. The minister of information, who made the announcement at a press conference, said the cell was “planning to assassinate protesters”. The movement didn’t issue a prompt response regarding the accusations made. Authorities released a video of university students saying they belonged to the Abdel-Wahed Mohamed Nour movement. According to the videotaped statements, the students were planning to execute sabotage operations during the demonstrations. During a speech he gave while visiting Gezira state in central Sudan, Al-Bashir said the country was targeted. “A war is being waged against Sudan for its adherence to its religion and its pride. Sudan will not sell itself for wheat or dollars,” he stated. Sudan’s economy plummeted after the secession of oil-rich South Sudan, resulting in the loss of more than 60 per cent of Khartoum’s hard currency resources. The severe shortage in foreign currencies resulted in the government’s inability to provide bread and fuel, leading to protests. To make matters worse, people are not able to withdraw their bank savings or cash their salaries because of the lack of liquidity. The Sudanese currency depreciated from 18 pounds to the dollar when US sanctions were lifted from Sudan in October 2017 to more than 60 pounds to the dollar on the black market.